Port Alberni—Tanned, tired, and truly humbled by the unique experience that they shared, the participants of the 2011 Pulling Together Canoe Journey gathered for one last celebration on July 8. 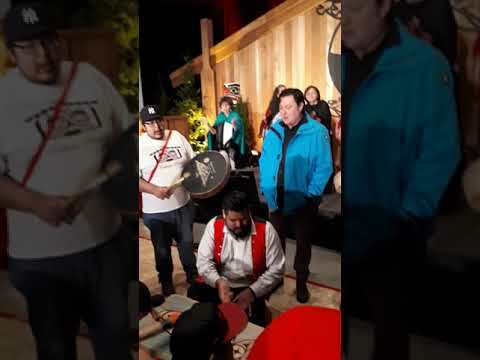 They were hosted at the House of Gathering by the Hupacasath, who filled their guests' bellies with sockeye pulled from the Somass River, which also served as the final stretch of an eight-day journey to remote Nuu-chah-nulth communities on the West Coast of Vancouver Island. Representatives of the RCMP, department of Fisheries and Oceans, Vancouver Police Department, and other law enforcement agencies, teamed up with First Nations young people for the trip of a lifetime. They traveled along the ancient waterways of the ancestors to visit with the Ahousahts, the Toquahts, the Tla-o-qui-ahts, Ucluelets and Huu-ay-ahts, all in an effort to get to know one another better, through struggle, hard work, and a lot of fun. After high winds and stormy weather scuttled the last days’ paddle down the Alberni Inlet, the pullers gathered at Tseshaht’s Paper Mill Dam Park for one last run toward the final stop on their journey. They zipped along the Somass to Victoria Quay where they were greeted by friends and family and a lot of curious citizens of Port Alberni. Among the paddlers were such dignitaries as Mayor Ken McRae, and Tseshaht Chief Councillor Les Sam, who pulled in the new Tseshaht canoe that led the 18 others along the river. Next came the Hupacasath canoe with the Nuu-chah-nulth participants, members from a number of nations who gathered under the name Tsu-maas Family. After lining up along the rocky edge of Port Alberni at the Quay, the canoes went on to Clutesi Haven Marina where they were welcomed by elders of the Tseshaht and Hupacasath First Nations, which share the territory. Ron Hamilton offered up a prayer chant, and under a shower of eagle down, the Pulling Together participants were proclaimed friends and thanked for “paddling to our shores.” Hamilton said “you are all good people,” adding they were welcomed and encouraged to return at any time.